Are you ready to go to the beach? Yes of course, and you can go to the beach all year around here in Bohol. Bohol is blessed with white sand beaches. The sand in Bohol is a soft white sand, and is exported around the world. 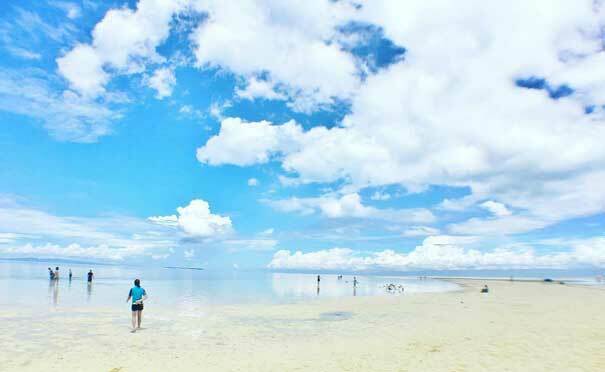 Bohol beaches are just as beautiful as Boracay, without the crowds. 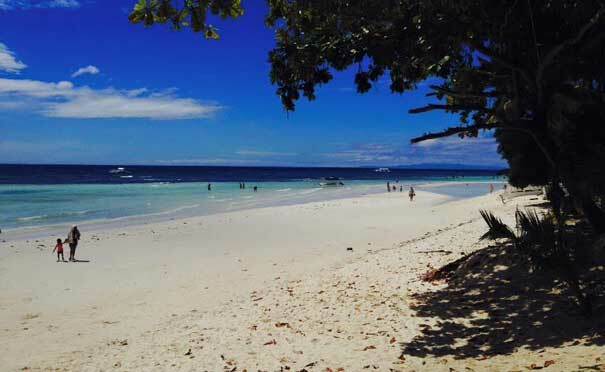 Most of the beaches are concentrated around Panglao and is an easy access for the new international airport. 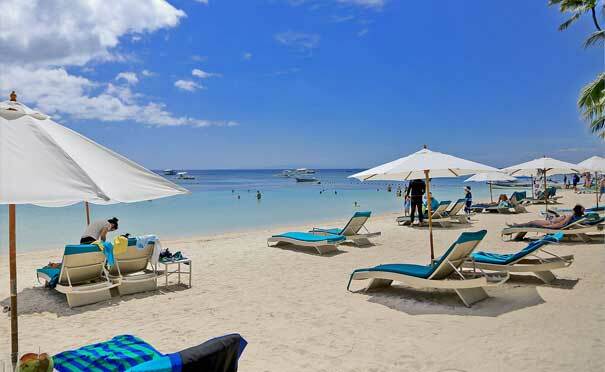 Alona Beach is located in Tawla, Panglao, Philippines. This is one of the most famous tourist spots in Bohol province because of its white sand beach, and the rocky cliffs, that surround it. The beach is well known for the many international restaurants, and also as the gateway for diving or hiring boats for day outings. Alona, is located near a house reef where corals and colorful fishes can be seen even without diving equipment. You can do some snorkeling, deep under the water and the beach is also emerging as a popular scuba diving spot. 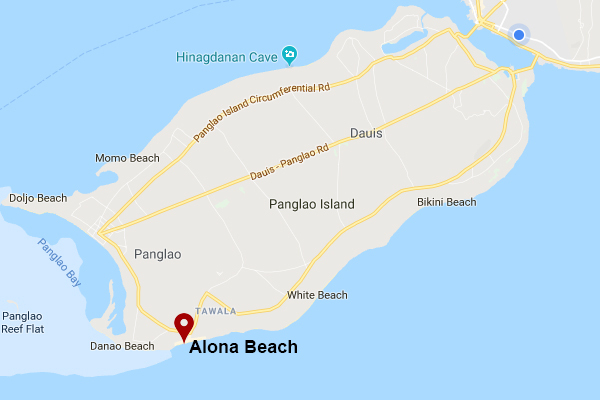 Alona beach has no entrance fee. It is free to go to. However there is a parking fee, usually about 25php. With many dozens of separate restaurants, Alona has a good selection of restaurants. This includes Italian, Germany, Austrian, Thai, French, English, Belgium, Swedish, Chinese, Greek, Korean, Indonesian, Filipino, incredible amount of seafood, and more. Its easy to stroll along the beach and to find a good selection of food. Alona also boasts a nightlife, with many live bands, and places to drink. Alona, also has the most available diving companies, in Bohol, to hire for day or night diving. Also the beach hosts many resorts and small hotels with cheap accommodation or a luxury stay. Alona has the highest concentration of places to stay in Bohol. Download the free Behold BOHOL application to find, where to stay in Alona beach Panglao. From the Ferry Port in Tagbilaran or Tagbilaran Airport, is about 20 km or 15 min taxi ride to Alona beach. If you don’t have a pick-up service from your hotel, take a meter taxi or if you don’t have much luggage one if the motor caps that wait near the exit of the pier or at the airport. The fare to Alona beach from Tagbilaran should not exceed 300 peso for a tricycle or 650 peso for a taxi (long distance ride: meter x 2). Negotiate the price first, before entering the taxi. Don’t pay too much. Getting back to town from Alona beach, you may woke up the small hill in the middle of the beach and take a jeepney for a few peso or wait for a taxi or tricycle. Bolod Beach is found at Bolod, Panglao, Bohol with its quiet beach and beautiful clear water you can just dive in. As peaceful looking as it is you can hear the sound of the waves, perfect for relaxation, and it’s got some soft white sand. I reckon its a pretty good beach for swimming and family outing. Overall its a peaceful quiet beach. Bolod beach is perfect for a family outing, a place with wide sand beaches. During low tide you can walk very far out into the sea and still see your feet. The water is especially shallow. There are not very many restaurants or food stalls available. We suggest that you bring your own food. You can rent a cottage, and have a lot of fun. Download the free Behold BOHOL application to get directions here. 12 minutes from Tagbilaran City and 15 minutes from Alona Beach. From Tagbilaran, Airport and Seaport Whole Tricycle Fare minimum 300 Php negotiate the price first. You can also ride a jeepney at Bohol Museum, it’s cheaper if you arrived at daylight. Discover Dumaluan beach at Dumaluan, Panglao Island in Bohol Province. One of the most visited beach in the island whether it’s local or international tourists. Its captivating view with an ambiance of a nicely tropical vibe and a beautiful coverage of white beach sand that’s perfect for lounging or sun-bathing. It’s got some soft, white shore and clear blue waters where you can do some snorkeling or maybe do some water skiing. Dumaluan has an entrance fee, but is a low cost. At the beach you can rent, a cottage for a family picnic, and private party. Dumaluan beach, is a short walking distance from Libaong white beach or Bolod beach. From Dumuluan, you can walk to Bohol Beach Club, or South Palms beach resort. A jeepney ride from the terminal at Tagbilaran ity will get you there in less than 15 minutes. From Tagbilaran Airport and Seaport Whole Tricycle Fare minimum 300 Php negotiate the price first. You can ride also a jeepney at Bohol Museum it’s cheaper if you arrived at daylight. COST : 50 php per person, and 100 php for parking a car. It is a beach with very fine white sand and fringed by tall coconut palm trees and other tropical varieties. Located in Libaong, Panglao, Bohol. The water is crystal clear and reveals an underwater world of such beauty that made divers and snorkelers come back from time to time bringing in their friends and acquaintances. This is a beauty not to be missed on your vacation. This is a local favorite for sure. LIBAONG has a public road and is a free entrance. Also from Libaong you can find a pump boat and go to Pamilican island. Jpark, Amarela, and a future Henan resort are all being build here. From Tagbilaran, Airpot and Seaport Whole Tricycle Fare minimum 300 Php negotiate the price first. You can also ride a jeepney atBohol Museum it’s cheaper if you arrived at daylight. 30 minute drive away from Tagbilaran City, and from the Tagbilaran Airport. If you’re riding a Jeep Drop off at amarela crossing you can walk our ride a tricycle 600 mater ( 10 minutes walking distance). Anda Quinale White Sand Beach, a public beach in Poblacion, Anda, Bohol has a very clean environment. It has some of the finest white sand beach, very clear water. There’s some beautiful cottages that you can shade and enjoy the front view of how wide the beach is. Looking at the beautiful big waves that makes you wanna go for a dip. Even with low tide the vast sand is perfect for capturing pictures and have your kids to play. This is located a bit away from the city of Tagbilaran but worth the visit for sure. 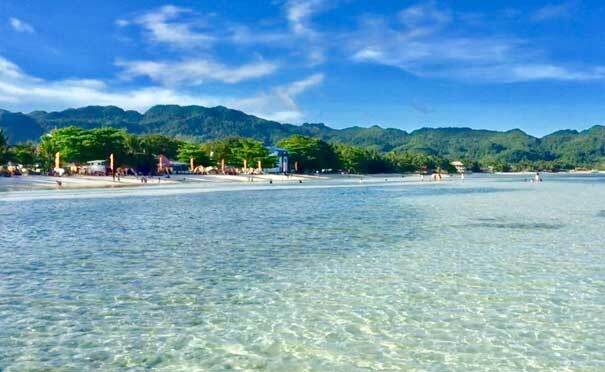 Anda beach is located near Poblacion barangay and is the best beach on the east side of Bohol. Anda is approximately 100 km from the City of Tagbilaran City. By Public Transportation – Bus & V-Hire Terminals are located at Dao Terminal, Tagbilaran City as service center of Bohol. Buses travel daily from Tagbilaran to Anda – Php 100.00 ( estimated 3 hours of travel). Van travel daily from Tagbilaran to Anda – Php 130.00 ( estimated 1 hour and 45 minutes of travel time). Clear blue water and wide white sand that will capture your eyes. Located in Doljo, Panglao Island of Bohol. A nice beach for relaxation because of its magnificent sunrise and sunset views. The water is very shallow good for walking or you can even take photos because there’s not much of a crowd here. Appreciate every place that you will see when you walk along to the beach. A really nice beach to swim especially in the morning. 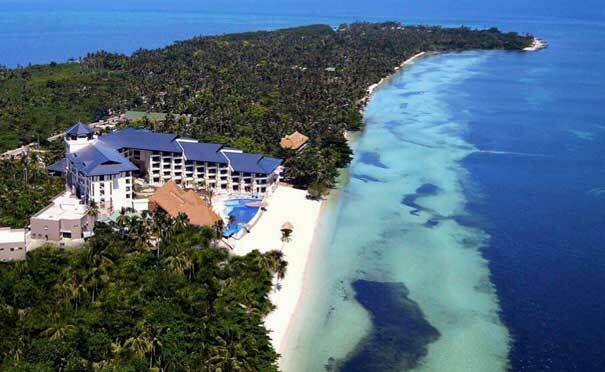 Doljo beach hosts the Bohol Bellevue resort. Near the beach is a diving spot. Doljo beach is also good for long walks, and talking to the friendly locals. You can also ride a jeepney at Bohol Musuem it’s cheaper if you arrived at daylight. Virgin Island is found off the coast of, Panglao, Bohol. You will need to hire a boat to get there. If you’re into beaches, and love unique beaches a lot this kind of beach is what you’re looking for. It’s got a great looking sandbar and very clear water. The perfect beach for everything either you’re getting tanned, take great photos overlooking the view or by the sunset feel free to just be in the moment with this so called paradise. The beach has stands that make Buko (coconut juice), sea urchins and other local delicacies for a very good price. During the low tide, the two sides, of the sand bar is nearly 2 km in length. The waters are shallow and warm. We have visited the place during rainy days and it was still a great experience. Virgin island has no entrance fee, but you will need to hire a boat to get there. You can also ride a jeepney at Bohol Musuem it’s cheaper if you arrived at daylight. You can also take a jeepney going to Panglao or tell a “habal-habal ” ( motorcycle for hire) to take you to Panglao Beaches. Be sure to negotiate the fare first because some drivers offer high rates especially to foreigners. Once in Panglao, you can approach any outrigger boat available in the island and negotiate to bring you and your friends to Virgin Island. Typically along Alona beach, you can charter a boat for seeing the dolphins, Balicasag Island, and Virgin Island. A typical cost is about 400 – 500 pax. 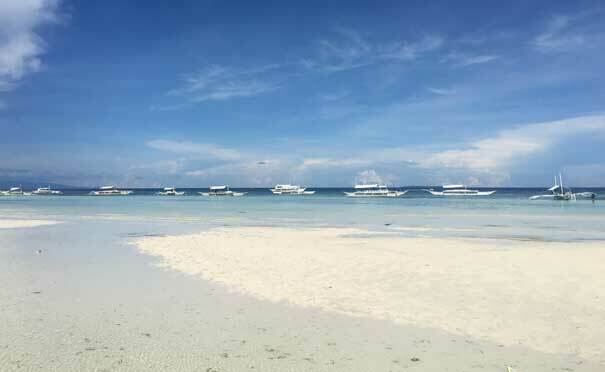 Other places to find a boat are from Poblacion in Panglao, and also Doljo beach in Panglao.